This is Kathryn. Actually, I never did ask how to spell her name correctly. Since she's one of those Alternapendent type of University people she probably spells it CkA7hyrnne, or something like that. I suppose this picture could even have been part of my Interesting People series, since "Kathryn" is definitely one of those too, but I put it in the random picture series since it was the event I came to see, not the person. This picture was taken at Fort Needham Park, in the "scary" North End of Halifax, during a free outdoor concert and picnic put on by CKDU 88.1 FM (as you can see on the banner). 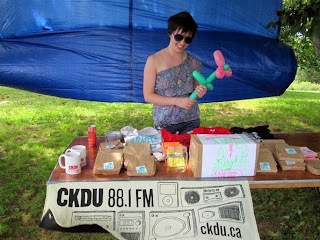 CKDU is an independent radio station at Dalhousie University, and "Kathryn", who works at the station, organized the entire concert event. I had relatively little interest in the concert, since living in Halifax means there's a free concert or three every weekend, but I never grow tired of free food.